This gorgeous little town is only 4 square km or 48 blocks and has only 2,263 permanent residents. Old Town of Lunenburg was named a UNESCO site in 1995. It is Instagram heaven with colourful houses lining the streets, a picturesque harbour, great food and super cute street signs. 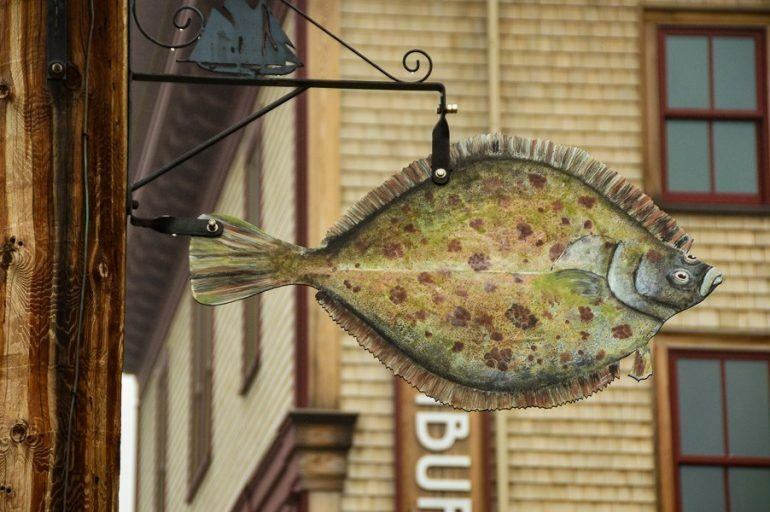 Here are the best things to do in Lunenburg. The closest international airport to Lunenburg is in Halifax. Lunenburg is approx. 75 minutes from Halifax airport. There are a couple of public transport options. The first is the Maritime Bus. This bus runs between Halifax and Lunenburg and has several daily departures. The second option is Alternative Routes. This is a hop on hop off bus that runs across Nova Scotia. It stops in Lunenburg at midday so you can stay the night. The bus runs throughout the summer months and then on a limited schedule in the winter. If driving take Highway 103. If you have the time take the lighthouse route which is a lovely drive. When I visited I came from Annapolis which is an easy drive. If you have chosen not to hire a car there are quite a few day trip options available from Halifax. Finally, it is also possible to get to Lunenburg by sea! It is possible to sail right into Lunenberg harbour and drop anchor! 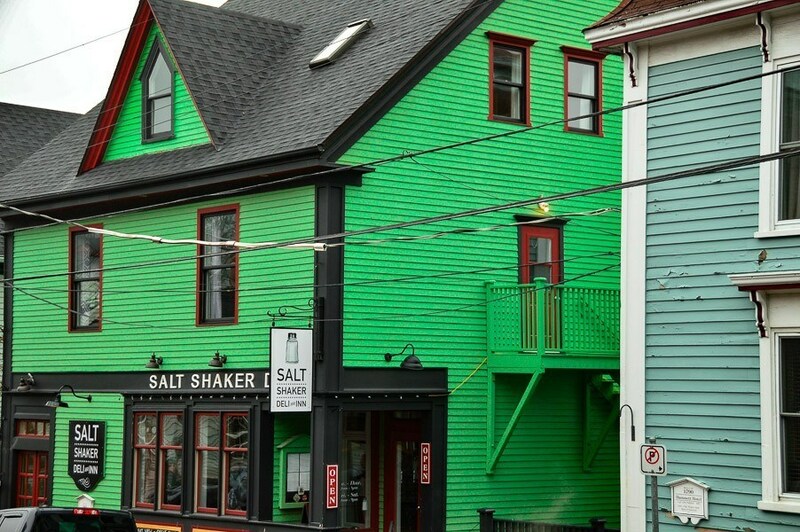 Fleur de Sel was perhaps the most famous restaurant in Lunenburg. Its French menu is designed and cooked by Martin Ruiz Salvador. Alas, it has recently closed but the owners have a new restaurant Beach Pea Kitchen & Bar that is getting rave reviews. Unfortunately, you can’t book so arrive early! Grand Banker is located on the harbour and has great seafood to go with some stunning views. They are famous for the Lunenburger – six ounces of local ground beef, smoked mozzarella, smoked bacon, baby spinach, a lot of Nova Scotia lobster and tarragon butter sauce. All on a local artisan bun. And a bacon wrapped scallop because why not! I must confess, I could not face the Lunenburger. But wow did I have a delicious meal at the Grand Banker! I went super soupy with amazing seafood chowder and then a full-on seafood stew. Gosh was I full but wow was it good and the quality of the seafood just outstanding. Lincoln Street food is a modern restaurant serving up delicious and healthy fare. The No 9 Coffee Bar turns into a tapas restaurant in the evening. 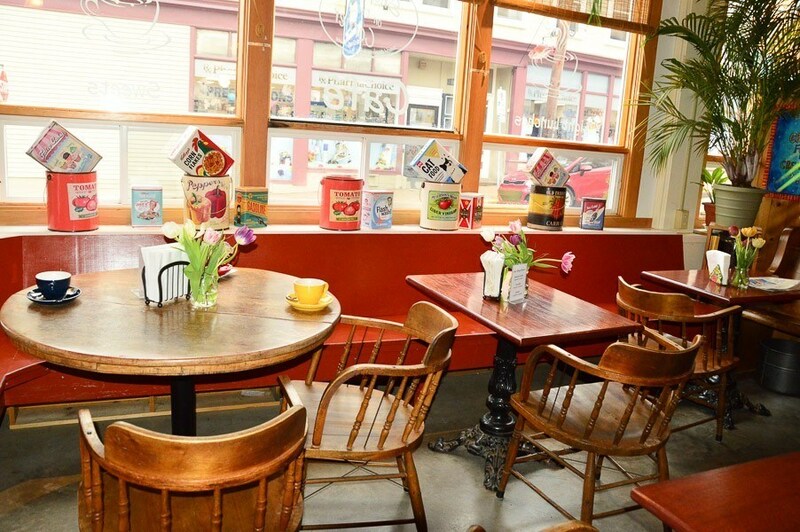 The Salt Shaker Deli has award-winning seafood chowder. It is owned by the same people as Fleur de Sel. 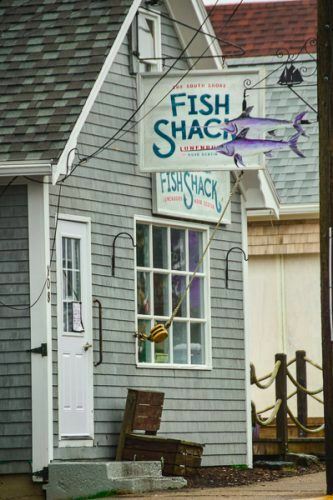 They also own the South Shore Fish Shack which is well rated for all things seafood. And they own the Half Shell which is an oyster bar. The Savvy Sailor is also well regarded. I had a delicious breakfast there. Check out their eggs benedict which is served with crispy tasty bacon rather than ham. The Old Fish Factory is another good option – especially for scallops topped with bacon jam. I stayed at the Brigantine Inn & Suites – they have amazing views! 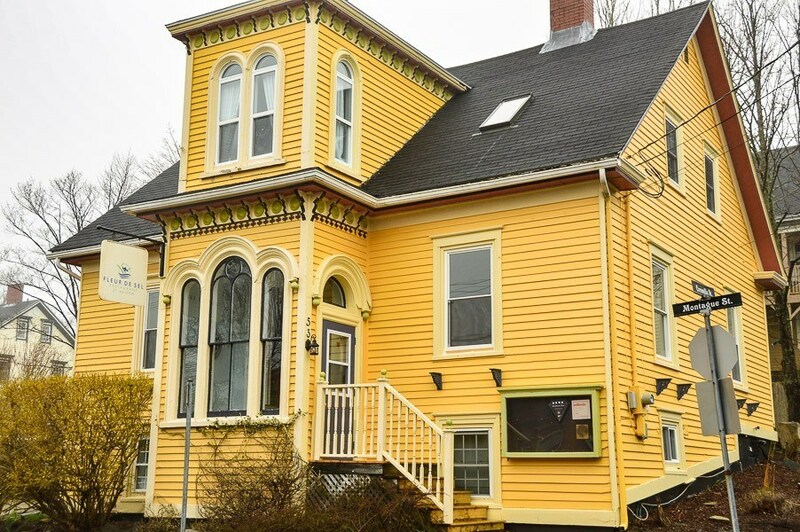 The oldest B&B in Canada is in Lunenburg and it still runs in the summer. The Salt Shaker restaurant is also an Inn with rooms for rent. Like this article? Why not Pin It? This is my must do in Lunenburg! 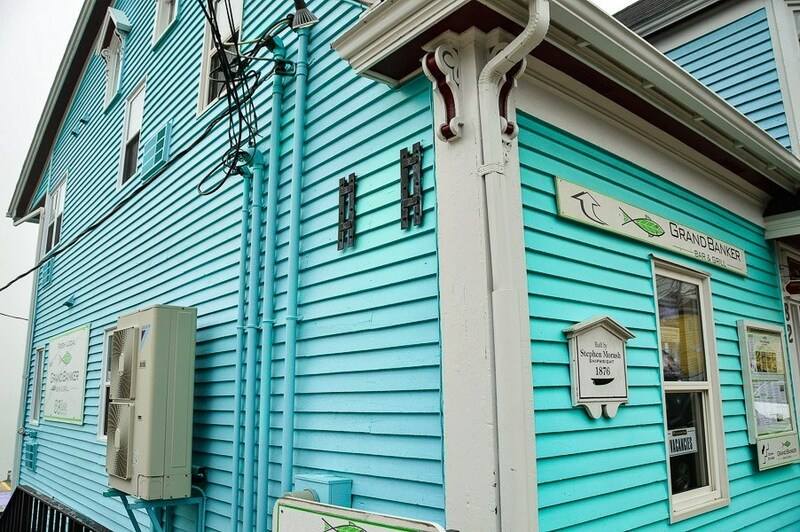 I don’t often nominate a walking tour as a must do but my gosh – don’t miss the Travel Lunenburg Walking Tour! This is one of the most entertaining walking tours I have ever done – and there is the most fantastic revelation at the end regarding its owner – which I am not going to ruin for you! Not only will you see everything from the first house in Lunenburg to the church rebuilt by the townspeople to how towns settled by the Germans are so different to those by the English – you will just be spellbound by the engaging and fascinating tone and passion of the guides. 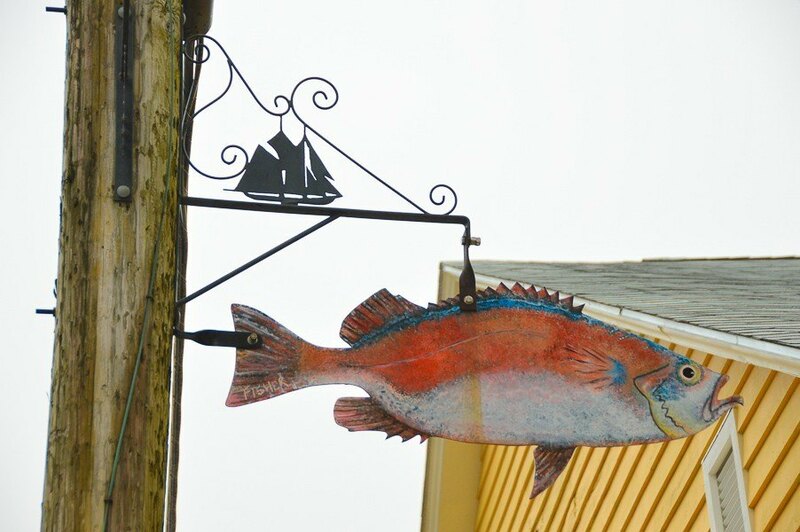 This was the first thing I did in Lunenburg and I was in love with this little town (even in dreadful weather!) by about 30 minutes in. This is one of the most entertaining tours you will ever do – I promise! – and the passion for lovely Lunenburg is so infectious. The owners also produce a fantastic free Lunenburg Guide that I highly recommend you download. I like to download these kinds of guides onto my iphone and put them in the bookshelf/library section. 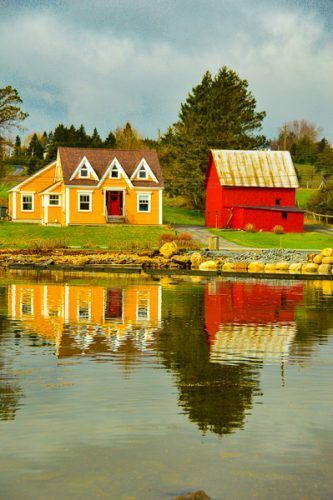 The best shot of the red wooden houses on the water in general and at sunset is said to be from the Bluenose Golf Course on the other side of the harbour. You’ll need a car or be in the mood for a decent walk. 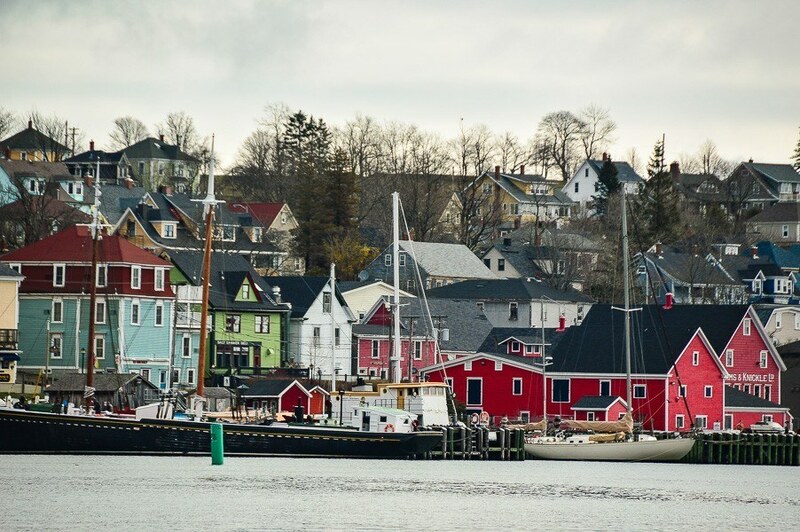 Lunenburg is one of only two Urban UNESCO sites in North America. All 48 blocks became part of UNESCO in 1995. 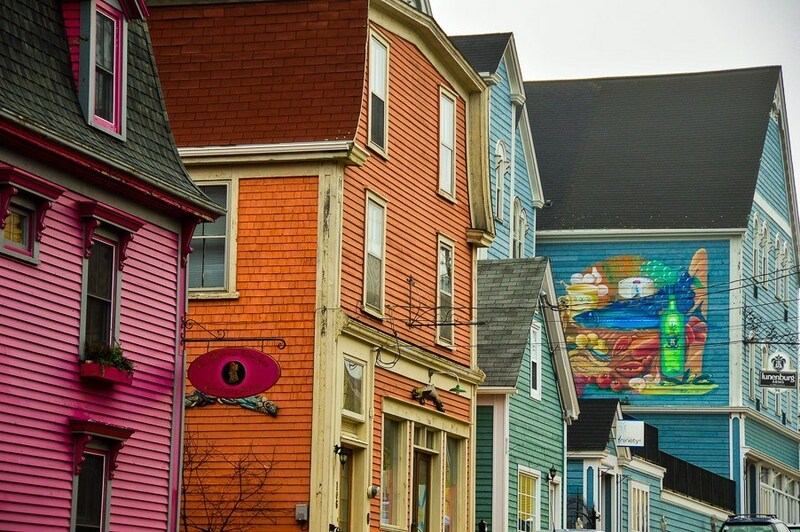 Every block in Lunenburg is colourful and quirky. Each house is its own carefully chosen colour – from pastels to brights. 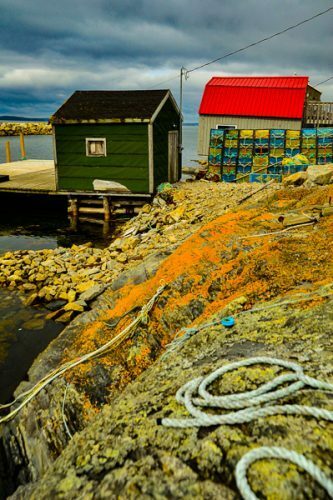 The harbour is gorgeous with colourful wooden buildings. Even the street signs are super cute with different fish! Much of the unique and quirky look of Luneburg architecture is thanks to the fact that so many ship builders lived in Lunenburg and applied their skills to homes. It is not often you find a distillery in the middle of a cute town’s downtown! 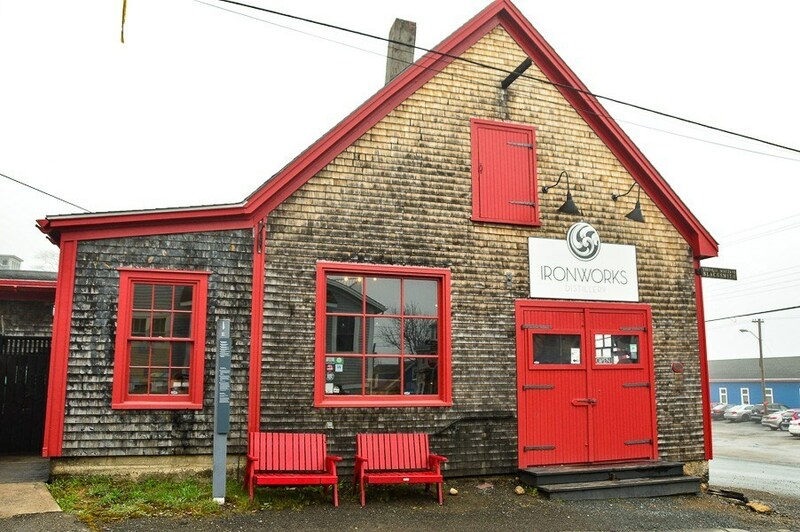 Ironworks Distillery is located in a historic building where they hand craft their brews using local ingredients. They run tours and will happily take you downstairs and show you their barrels and process. Their dark rum is very well known. Make sure you try their amazing berry liqueurs! 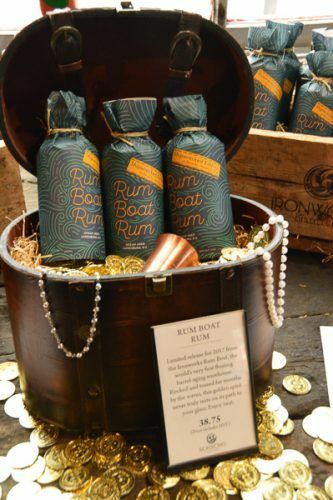 And don’t leave without having someone tell you the fantastic story of their well named Shipwreck Rum! Another great place to get a unique drink in Nova Scotia is the fantastic area of Wolfville – Check out my Wolfville Wineries Post. 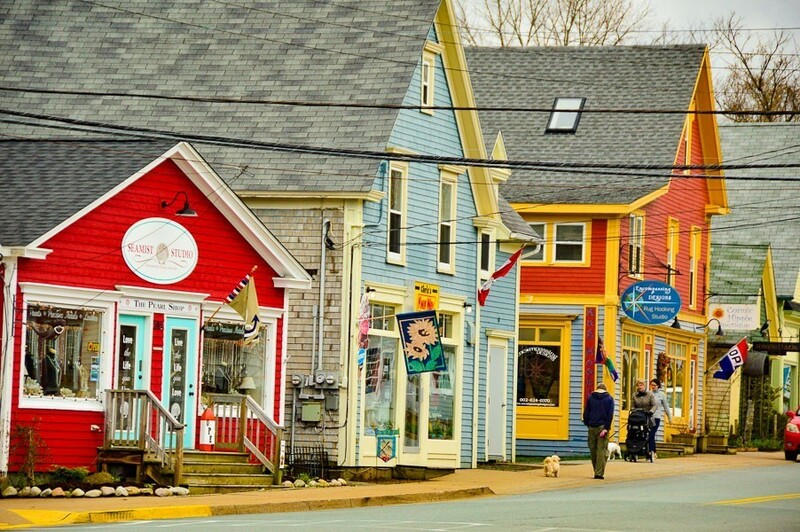 No 9 coffee bar, the Bicycle Lunchbox and Kate’s Sweet Indulgence Cafe are three of the best spots to get a good flat white in Lunenburg. I particularly liked The Shop on the Corner which also sells some fab things. The Grand Banker, Salt Shaker Deli, South Shore Fish Shack, The Half Shell, the Savvy Sailor, the Dockside Restaurant and the Old Fish Factory Restaurant. There are alot of seafood restaurants in Lunenburg given its size and the standard is very high! Make it a priority to have local seafood at least twice a day when you visit! The Lunenburg Farmers Market has been running every Thursday for 30 years! It runs from 8am-12 on the South Shore in the Lunenberg Community Centre. Don’t miss the buffalo cheese and cranberries. I love a Farmer’s Market – whilst in Nova Scotia I also visited the Halifax Farmers Market and the Wolfville Farmers Market – click through to read more! Check out the replica of the Queen of the North Atlantic Bluenose II. If she is in port she will be near the Fisheries Museum of the Atlantic. You can also see her on the Canadian 10 cent coin! She was a fishing and racing legend until the original was lost at sea off the coast of Haiti in 1946. There are many colourful buildings and tasty places to stop. Whale Watching season is May through October. Tours are run through Lunenburg Whale Watching and run daily for three hours. Go boating, sailing or fishing with Star Charters or Lunenburg Ocean Adventures. Or head out on a kayak with Pleasant Paddling. If you like being on the water don’t miss the number one tour in Nova Scotia – Harbour Hopper Halifax. 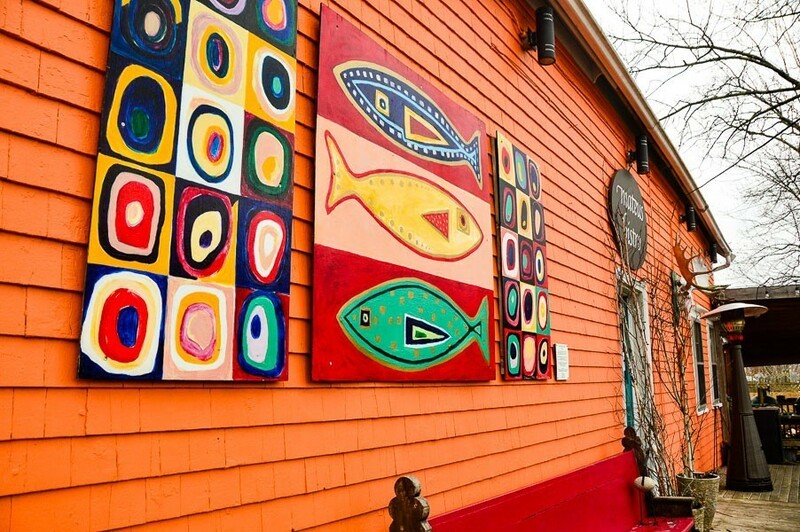 The seafront vistas and lovely streets of Lunenburg have long attracted artists. Today there is still the Lunenburg School of the Arts and the NSCAD University Residency Program. There are loads of galleries and shops featuring art works. Check out Cranston Gallery, local artists at the Quartet Gallery and the Laurie Swim Gallery. 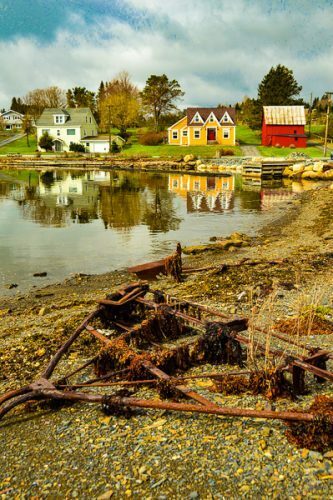 Lunenburg also has over 90km of trails available for cycling, walking, running or hiking. Try the Back Harbour Trail, Gaff Point or if you’re feeling more ambitious the 10km Bay to Bay Trail. For more detail visit the Lunenburg Region website. I am not normally that into visiting churches unless they have an element that is particularly unique or different. This is one of those churches. It is a very attractive building inside and out and a Canadian National Historic Site. It is also recognised as one of the best examples of Carpenter Gothic Architecture. However, the real attraction here is the story of St John’s and its place in the community. 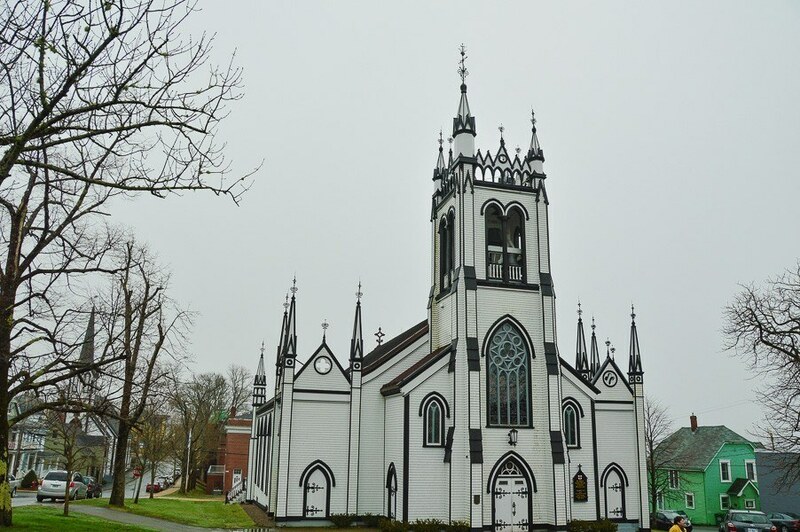 All of Lunenburg was shocked and devastated when this beautiful church burnt to the ground in 2001. The story of how the community worked together to preserve the church and then re-built it is very moving. This story is best heard on the Lunenburg Walking Tour. Don’t miss this gorgeous little area – particularly if you are a photographer or artist. It is ridiculously picturesque. And still a working fishing village! 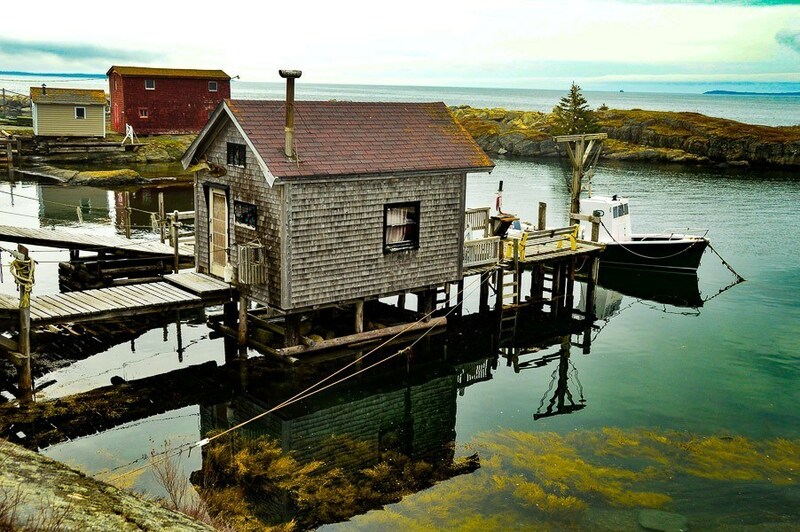 Blue Rocks is a little cove with old boats and cabins that looks like it was designed for a Hollywood film. 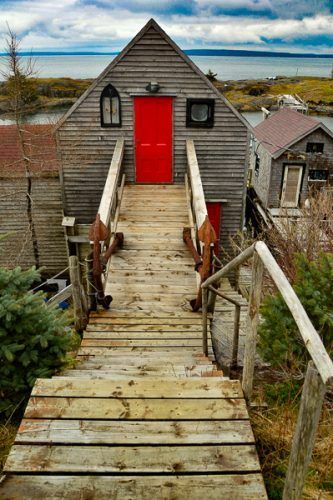 It is lovely to explore and about a 6 minute drive from Lunenburg. 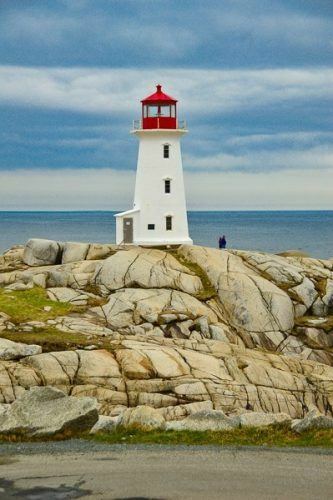 Peggy’s Cove is the home of Peggy’s Point Lighthouse – often referred to as the most famous lighthouse in all of Canada – and Canada has a lot of lighthouses! Peggy’s Point Lighthouse has been sending out its beacon since 1868. It is obviously a very popular tourist spot. 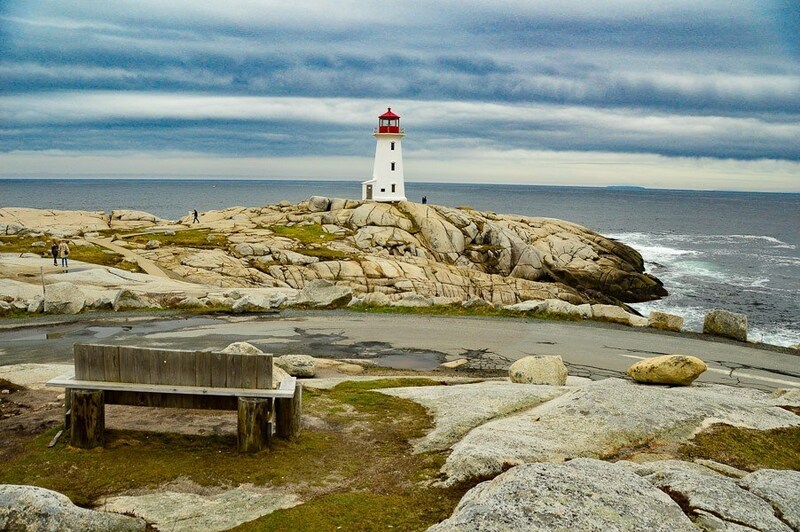 What surprised me was that given how popular it is the town of Peggy’s Cove and the lighthouse itself are still extremely beautiful – and not in a Venice style grown up story book way. In that genuinely lovely way that Blue Rocks is – a good job has been done keeping it from turning too Hollywood! 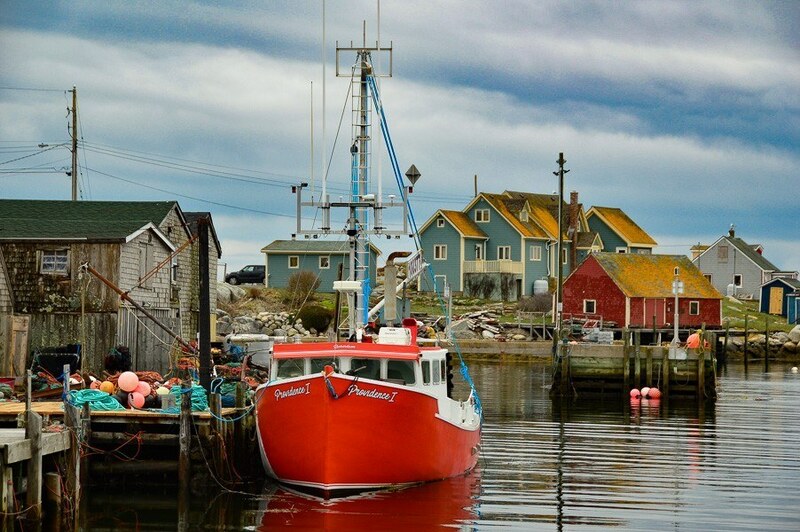 The Cove itself is extremely Instagram friendly – I think I took more photos of the boats and buildings than I did of Peggy’s Cove itself! Peggys Cove – so photogenic! If you have hired a car (this is what I did) the road is incredibly well signed. Drive through Peggy’s Cove to get to the general store/restaurant where you can park and then walk to the lighthouse. It is perhaps a five minute walk from the top of the car park. There are isn’t much more to see than the lighthouse – and some lovely views out to sea. If you’re into photography I would aim to get there late afternoon for some lovely light. There are lots of different angles to play with and a few short walks around. I didn’t eat at the general store/restaurant but it looked pretty good! 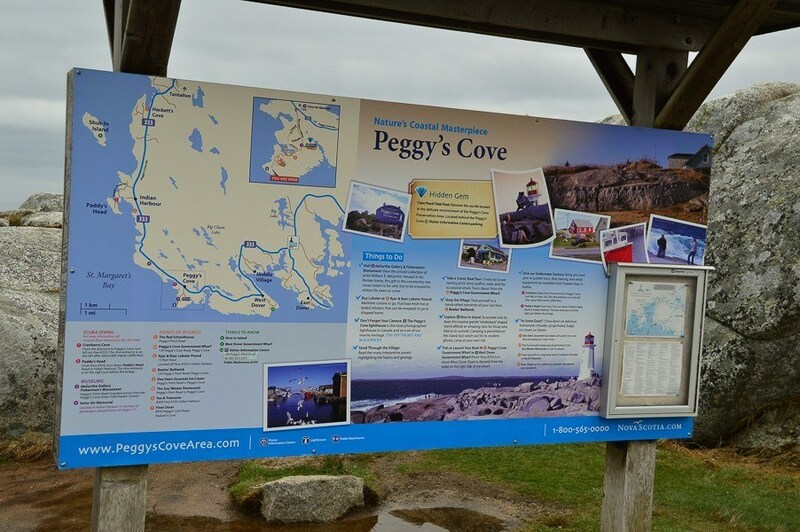 The other option is to visit Peggy’s Cove in a daytrip from Halifax. Mahone Bay is between Lunenburg and Peggy’s Cove. 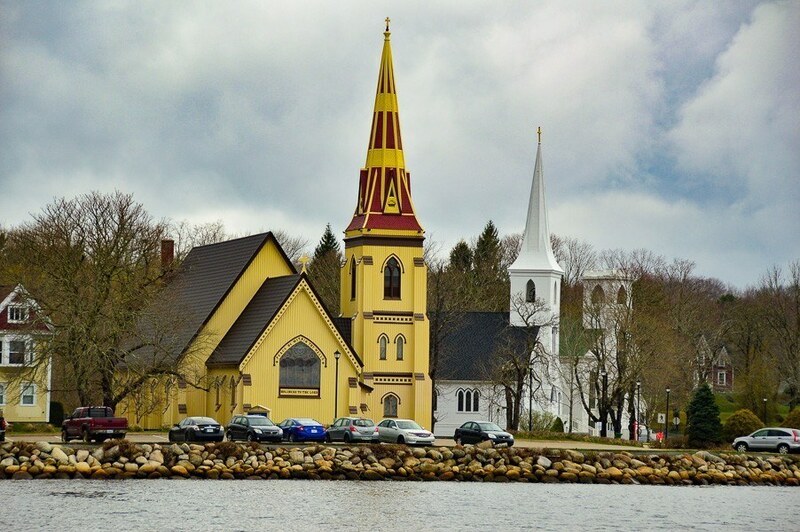 It is a super cute waterfront town and well known for its Three Churches view – it is possible to line up three different churches for a great photo. The town is also known for its festivals. These include the Great Scarecrow Festival, the Classic boat Festival and the Father Christmas Festival. There are also loads of cute shops and cafes. If you are doing a day trip from Halifax to Peggy’s Cove most will include a stop at Mahone Bay. If you have a bit more time and are interested in potentially getting rich (who isn’t???) then check out Oak Island. 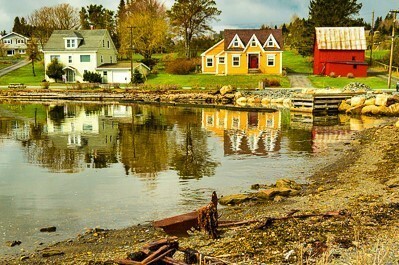 This 140 acre island (one of 360 islands around Mahone Bay) regularly hosts treasure hunts. Did I miss somewhere you know and love in Lunenburg? Drop me an email at [email protected] and I’ll look at including it. If you click through on some of the links in this post and make a purchase I will receive a small commission. Just wanted to make sure you knew. Thanks very much to Visit Nova Scotia for helping me to plan and sponsoring my trip to fabulous Nova Scotia. Looking for a lovely small town with loads of character, interesting stories and very instagrammable streets? 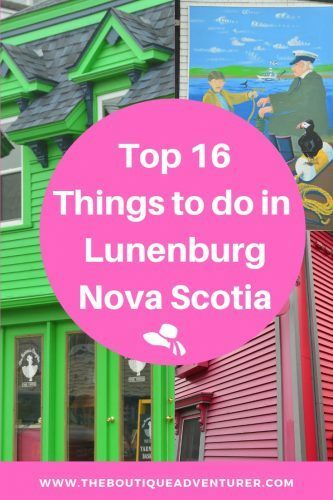 Here it is - and the top 16 things to do in Lunenburg and around Lunenburg Nova Scotia - Find out more here! Next articleBest London Food Tours: The Tours not to Miss from a Local! You know what would I do, if I were in Lunenburg? I would visit last 3 places especially Peggy coves and Mahones bay. But I would surely go for a coffee and whale watching. Thank you for the suugestions. I wish you could have covered some bakery places also. Thanks Aditya – they are all good places! Gosh there wasn’t a particularly great bakery that I visited – I always try to curate and just share the things I know are really good. I guess I’ll just need to go back and find one! It’s just Mahone Bay, not Mahones Bay as indicated under the photo. 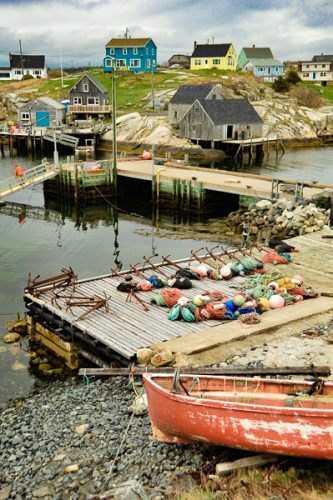 Otherwise, good article, from someone who lives between Lunenburg and Peggy’s Cove. thanks Janice! I have made the changes! This looks like such a great town. I just love the buildings and all the colors. I Need to get here one day. I’m always nervous about visiting new places because I worry that I won’t know what to do- or I’m intimidated by the surroundings. I didn’t feel that way after reading this article!! thanks Kristen – that is great! All I want to do is go there and take a million pictures. I love everything I see! I felt the same way! and these photos were taken in quite average weather! me too! Love a cute little town and the church is lovely! they are real! And it is that cute! Wow it is so beautiful there! I would love to see it in person. Lunenberg looks like an interesting place to visit. Looks like there is so much to do. Definitely have to add it to one of my places to visit. thanks Dwight – I highly recommend it! All of the colors are just amazing! This looks like a postcard, I don’t think I would be able to leave it looks so unbelievable! This town looks so beautiful!! This is definitely going in my bucket list, thanks for sharing!! and it is that beautiful in real life as well! Wow..what a great looking town! I love those buildings and their color. Awesome looking. Thank you so much for this great post filled with great information! I am looking for new cities to explore with my family and this looks like a great opportunity for family time! What a photographer’s dream! I would probably sit at the lighthouse all day because that view is sufficient to fill my mind and soul. It reminds me of Key West and Otrabanda in Curacao. It was a photography dream Alvern! I haven’t been to key west or otrabanda but I think I might like them! Seems like a really lovely place for a getaway. So many things to do and lots of picturesque spots! It is! Lovely people as well! Wow! Lunenburg looks and sounds soooo wonderful! I should include this on my bucket list. I am so excited to experience everything from this amazing place! So many great things to do! This looks like a place with so much character! Wow, Lunenburg seems like a nice place for a tour! I think i would have to plan to go there after the holidays. Oh wow there are so many things to do and things to see!! I love the sound of it all, we’ve never been! thanks Laura – I highly recommend it! Thanks – yes nothing like seafood to get me excited to visit somewhere! The churches are so unbelievable. Here they all look the same with boring colours etc. I love these they make your photos look like postcards! I think this place is gorgeous. The history behind it tells it’s own story. The house colors are adorable. Thanks for giving us some wonderful things to do in and around Lunenburg. I would love to try some of the restaurants you mention. Good job you have done. It is a stunning town Gavin – well worth a visit! wow! what an amazing place.I want to visit it aasap if I had a chance.I am a great sea food lover and obviously I can feast there! Yes Sri – particularly the oysters!